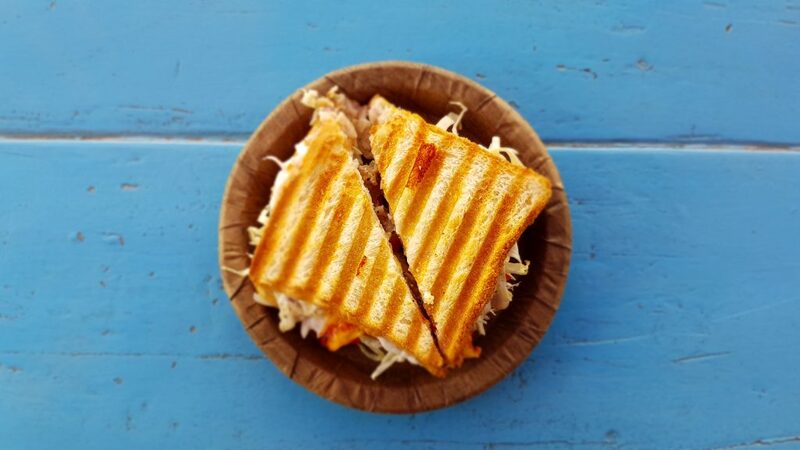 The delicious grilled sandwich called a panini can be made with various types of bread leaving many to wonder what the best panini bread really is. 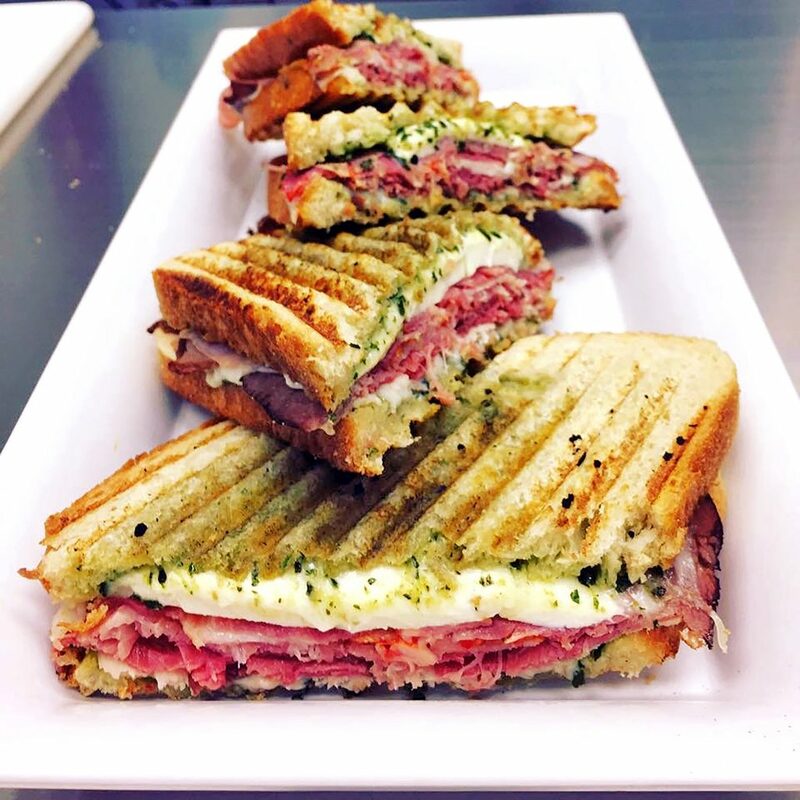 The good news is that a variety of breads add unique flavors to the panini. Here are some of the best bread for panini that I love making. 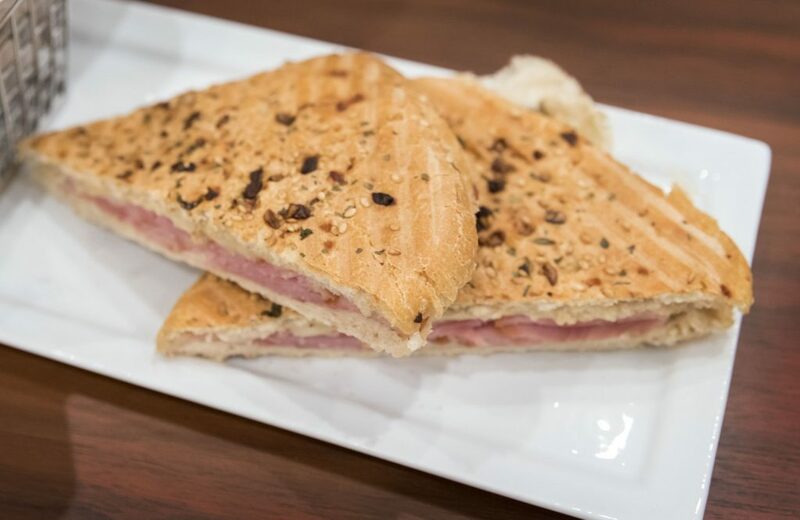 The best bread for panini is a dense bread as it holds up better to the grilling needed to create this sandwich. Using a bread that is not dense enough causes it to flatten during the grilling process often resulting in a flat soggy mess depending on the meats and cheeses used on them. Don’t worry, however, as that still gives you many wonderfully delicious choices perfect for making panini. 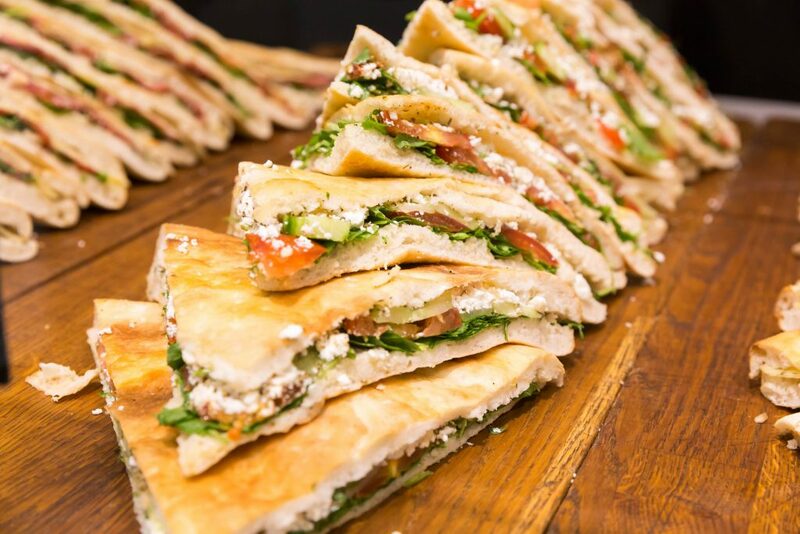 Since there are so many different types of fillings used for paninis, it can be difficult to choose the best bread. 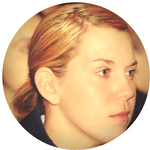 Asking yourself three questions often results in an answer suiting the situation the best. Think about the fillings that you plan to use so that you choose a bread that will stand up and not all apart. Consider if you want the bread to make a substantial contribution to the taste of your panini. 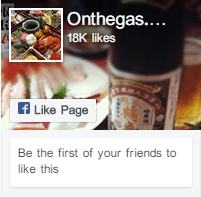 Finally, contemplate if you want to match the cultural cuisine of other ingredients used in your creation. It is easy to make a basic panini sandwich bread at home. Unlike other panini breads, this one has some air in it, so it works best when it is cut lengthwise. Combine 1 1/2 cups all-purpose flour, 1 cup cool water and ⅛ teaspoon yeast in a small bowl. Put the bowl in a large plastic bag. Let the mixture stand at least eight hours and up to 15 hours. Remove the mixture from the plastic bag and put in a large mixing bowl. Add all the remaining ingredients reserving 1 tablespoon olive oil. Beat with an electric mixer for three minutes at a medium speed. If a dough does not form, then increase speed slightly and beat for an additional two minutes. Insert a dough hook into your mixer. Beat mixture for another two minutes. Use a small amount of the reserved olive oil to grease a large bowl with your hands. 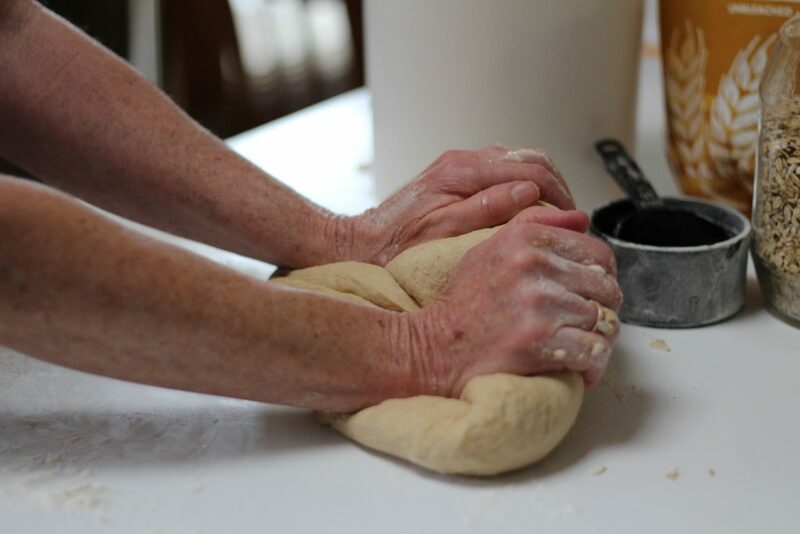 Place dough in the bowl. Let dough rise for 60 minutes. Then, punch it down. Let it rise for another 60 minutes. Lightly grease a cookie sheet with the remaining oil. 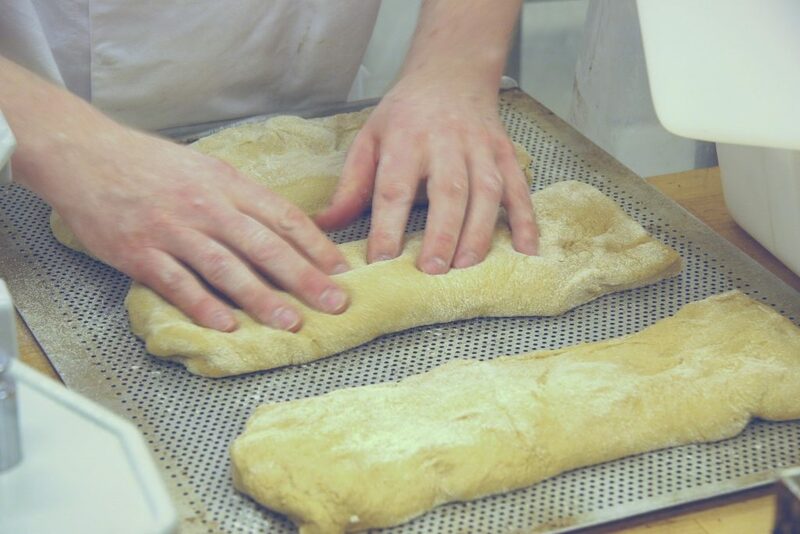 Divide the dough into two equal-size pieces. Roll one piece out to form a 10-inch log. If necessary, place a small amount of oil on your hands so the bread does not stick to them. Place the log on the cookie sheet being careful to keep it on one-half of the sheet. Using your fingers, flatten out the log until it is about three inches wide. Cover the dough with a slightly damp dishtowel. Let the bread rest for two hours. Bake the bread for 23 minutes. Turn off the oven. Remove the bread from the baking sheet. Place the bread directly on the oven cooking rack. Crack the door of the oven slightly. Allow the bread to sit in the oven until the oven is cold. 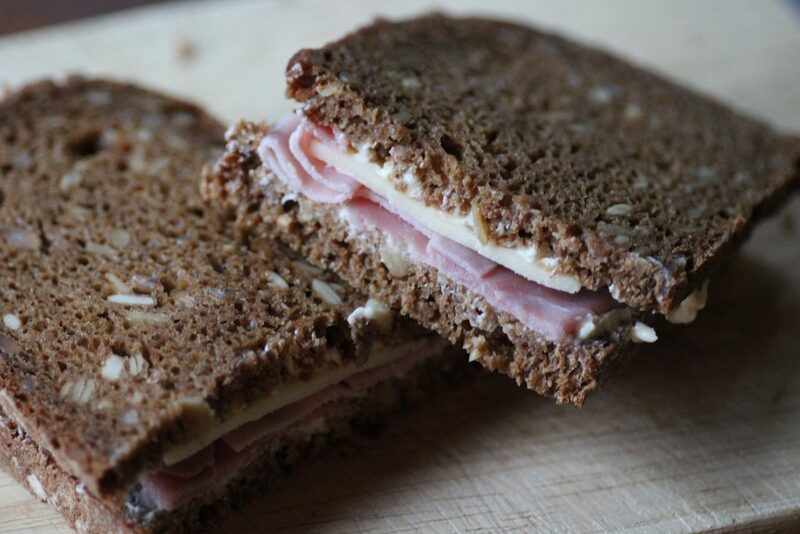 I love to make a multigrain bread as it tastes great while adding important nutrients to my diet. Place the yeast and sugar in a bowl with the water. Set aside until yeast activates. Meanwhile, put all the remaining ingredients except 1 teaspoon sesame seeds in a mixing bowl of a mixer with a dough hook. Start beating the mixture adding a tablespoon or two of water at a time until a soft dough forms. You may not need to use all the water depending on the humidity and your elevation. Make a ball of the dough and place it in an oiled bowl. Let sit for two hours until the size of the bread doubles. Divide the dough into 12 rolls and place on baking sheet. Sprinkle with remaining sesame seeds. Brush the top of the rolls with a small amount of water. Use a knife to cut a cross pattern into the top of each roll being careful to just score the top of the rolls. Preheat oven to 120 degrees Fahrenheit. Place the baking sheet inside the oven. Cover the rolls with a dishtowel. Turn the oven off and let the rolls sit until double in size. This should take about 15 minutes. Remove the rolls from the oven and preheat the oven to 400 degrees Fahrenheit. Put the rolls back in the oven. Bake for five minutes. Reduce the oven temperature to 350 degrees Fahrenheit. Bake for another 12 minutes until golden brown. 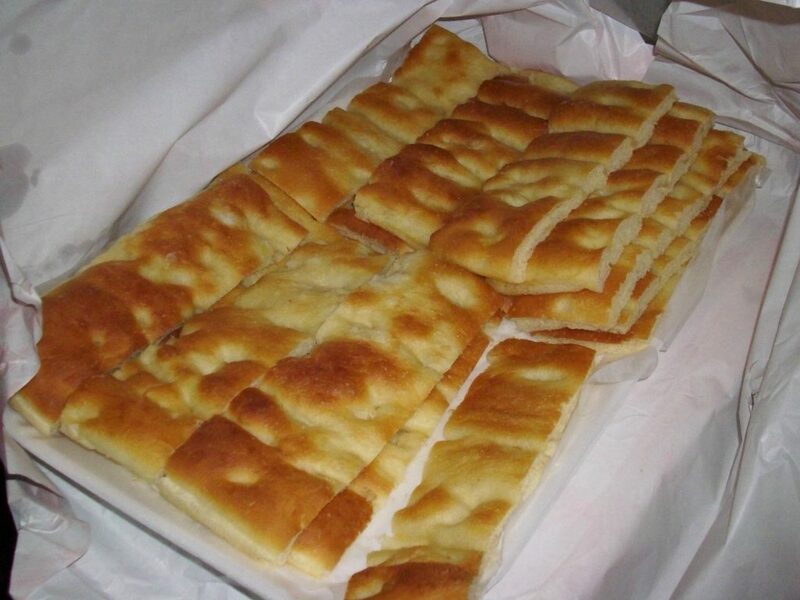 While there are several Italian panini breads, the one that works best and tastes the best, in my opinion, is focaccia. This bread that is loaded with herbs adds great flavor to a panini. Place potatoes in water and bring to a boil. Cook until tender but firm. This will take about 15 minutes. Remove potatoes from water. Reserve 1 cup water. Discard remaining water. On a clean dry surface, combine the flour and salt. Create a well on the right side of the flour and salt mixture. Use a ricer to rice the potatoes into the well. Make a second well on the left side of the flour and salt mixture. Combine the yeast and reserved water. Pour the water into the second well. Knead the dough for about 10 minutes until no longer sticky. Place a little flour on top of each ball. Place balls on heavily oiled baking sheet. Let sit for about two hours until double in size. Coat two large cookie sheets with olive oil. Press five balls out flat on each cookie sheet making sure to cover the entire sheet. Press your thumb into the bread about every two inches, but do not press all the way through. 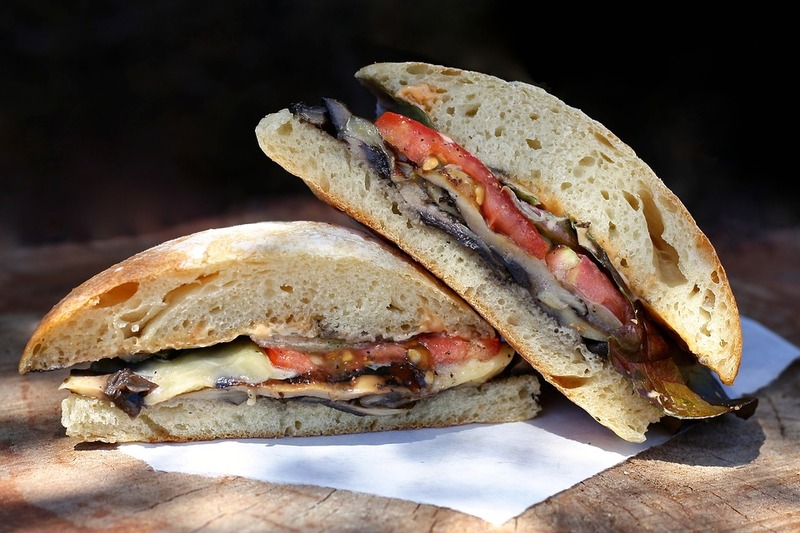 Another type of bread for an authentic panini sandwich is ciabatta. This bread was invented in Verona, Veneto, Italy, by a baker who wanted to create an Italian bread resembling French baguettes. Like many recipes, numerous bakers have put their own spin on this popular bread. Combine ⅛ teaspoon yeast plus 2 tablespoons warm water. Let stand for about five minutes until frothy. Add 1/3 cup water and 1 cup bread flour to yeast mixture. Stir until well combined. Cover the mixture and let stand for at least 10 hours and for up to 48 hours. Stir together yeast mixture and milk. Let stand for five minutes. Put mixture into mixing bowl. Add all ingredients except remaining bread flour. Slowly add flour while beating for fewer than 8 minutes. Use an electric mixer with a dough hook. Lightly oil a bowl. Form the mixture into a ball. Place the ball into the bowl and let sit for about 90 minutes until double in size. Divide the mixture into two balls. Lightly grease a cookie sheet. Place the two balls onto it forming each into an irregular oval. Let bread rest for another 45 minutes. Place a baking stone into the oven. Preheat oven to 450 degrees. After bread has rested an additional 45 minutes, then place bread on the baking stone without removing the stone from oven. Remove bread from the oven and cool on wire rack for at least 20 minutes. 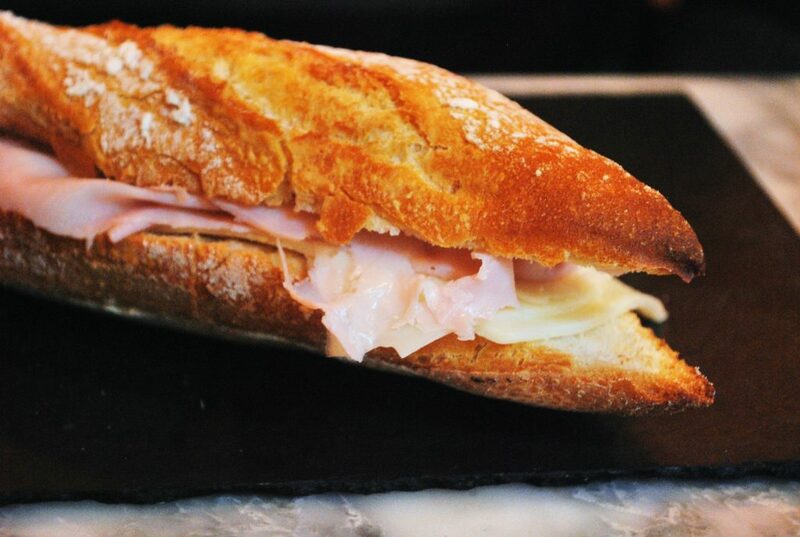 The most popular type of French bread used for paninis is baguettes. You can easily make this bread at home. You will love the fact that this recipe only has four ingredients that you probably already have at home. Combine 1/2 cup cool water, yeast and 1 cup flour in a small bowl. Cover and let rest for at least 14 hours. Mix all ingredients together using an electric mixer with a dough hook beating for four minutes. Place the dough in an oiled bowl. Let rest for 45 minutes. Punch dough down and then let it rise for another 45 minutes. Turn the dough out onto a greased surface. Divide into three equal pieces. Pull the corners of each piece into the center to form an oval. Cover with plastic wrap and let stand for 15 minutes. Take one piece of dough and flatten it out. Fold it nearly in half. Fold the edge over and seal like it was an envelope. Lift and turn the dough 45 degrees and repeat making the folds and sealing. Roll each piece into a 16-inch log. Set the logs on a baking sheet and let them rise about 45 minutes until they look puffy. Place 1 1/2 cups water in a cast-iron skillet. Place it on the lowest oven rack set in the lowest position possible. Place a baking stone on the rack positioned in the middle of the oven. Use a sharp knife to cut three to five slashes in the top of each log. Place the logs on the baking stone. Bake the baguettes for 26 minutes or until golden brown. Turn off the oven and open the oven door about two inches. 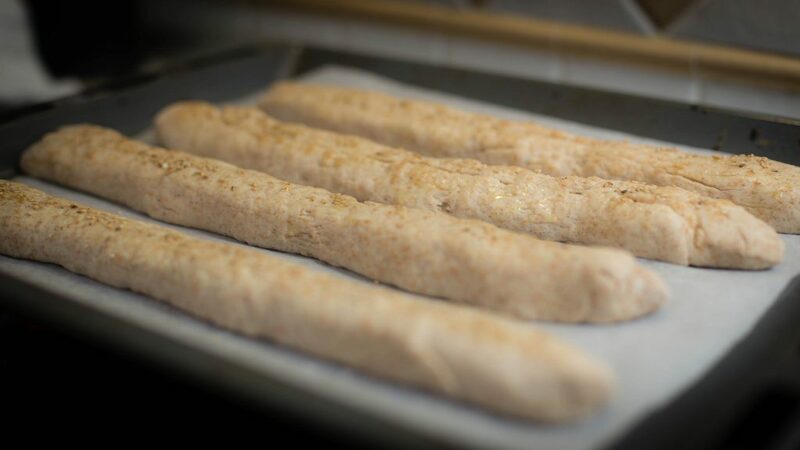 Let the baguettes sit in the oven until completely cool. Now that I have shared so many delicious ways to make bread for panini with you, there is only one task that remains. Try each recipe and see which one you think is the best bread for panini.